This is my lovely friend Becky displaying our banana JACKPOT that we came across late one night this weekend. We found these 2 bags of super ripe bananas for $1.49 per bag (each bag was 8-9 lbs)…which comes to about 19 cents per lb. I was practically beside myself with glee. BECAUSE…I had been on a “banana hunt” all week long, going from grocery store to grocery store trying to find some ripe bananas!! Everywhere I went…green bananas. And more green bananas. I was beginning to lose hope. And then we stopped by this place on a whim and WHOOOOOO HOOO! There is just NOTHING like a perfectly ripe banana. Sweet, dense, creamy. They can stop the most intense of cravings! You always want to eat them at the ripest you can…the antioxidant levels are highest when they are almost to the point of “spoiling”. Un-ripe bananas are not great for your digestion, so I would say stay away from them if you can. Check out the amazing nutritional benefits of bananas here. Entry filed under: Bananas, Raw. “Green For Life” Book Giveaway! 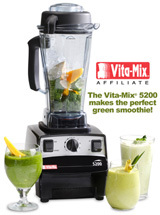 Blend it Up … and get Free Shipping! Isn’t it amazing how God provides for our needs! It’s fun to trust him for a healthy “Raw” diet and see Him deliver baskets of manna (or bananas). I have been praying for your raw journey as you travel, knowing it can be a challenge….but it looks like you are doing great!!! I sent you the next book but it came back?! Is there a better place to send it? Wow, I didn’t know that. I actually don’t like ripe bananas, but I love them slightly green and a little hard. Hmph. Guess I’ll have to start letting them ripen a bit! yummy bananas…any creations you’ve made with them? not that you need to … a banana plain or a banana with PB is heaven all by itself! Lots and lots of green smoothies. 🙂 I eat primarily sweet fruits throughout my day…and bananas are my fruit of choice. Sometimes I add raw almond butter, walnuts, and honey or agave for dessert. Yum! Ooh! We love bananas too! And what a fabulous price! I did not know that bananas are at their best when really really ripe. I will remember that! And I’ll quit buying them when they are still quite green. I like them less ripe, too! I had no idea it was better to eat them really ripe. I’ve also noticed the 2 places we shop for groceries have had only green bananas for a couple weeks now. It’s kind of weird. Sarah…nonsense! It’s a commonly asked question and you are correct in saying that peanut butter isn’t raw…nor can it be made raw. I think that they can only sell roasted for safety concerns specific to peanuts. I prefer raw almond butter for it’s nutritional value (and because Bella is allergic to peanuts)…and because I love the taste.. Peanuts have a high level of mold spores…which may explain why it’s a common allergen. I also just don’t like the roasting process in general. For those of you who are eating peanut butter … please check your labels. Conventional PB will almost always contain high fructose corn syrup and partially hydrogenated oil…2 of the biggest nasty additives. Natural PB is your best choice …or grind your own if the bulk section of your store has it. Yes…I have noticed lots of green too. I should also remind everyone to buy organic and fair trade when it is available. Conventional bananas are often artificially “gassed” to get them to ripen faster…and fair trade assures that the farmer was paid a fair wage. Plus, organic bananas just taste a million times better. Yum. apparently in Aus even organic bananas can be “gassed” because there has been studies on the gas and no proof of human problems. Just a heads up on that incase any other Aussies are reading this. regarding nut butters… i know when i made the change away from peanut butter it was quite difficult because i enjoyed the sweetness so much… i had to kind of force myself to eat almond butter… i found that cashew butter is a good transitional butter because it has more natural sweetness to it compared to almond butter. and i said “butter” WAY too many times in that comment… sorry! So I have to ask…is it hard going raw? Your blog(s) are always such a source of inspiration for me, and Happy Foody is no exception; so much so that I’m seriously thinking about changing my diet! My husband and daughter, though, are adamant omnivores and refuse to eat (or even smell!) anything that even smacks of veggie/vegan/raw–unfortunately, they are a united front, despite my best efforts. I think what I’m asking, then, is how would you suggest a transition from an “typical” American diet to one that is mostly, if not entirely, raw? Jessica…great advice on the nut butter. Cashew is really, really yummy too. The key is to make sure they are raw. You can make nut butters in a Vitamix and I think a Champion Juicer with the blank plate. Angie…it is definitely “easier” if your entire family does it…but it can totally be done even if it’s just you! I am going to be posting more about transitioning in the next couple of days…stay tuned! In the meantime, just start ADDING things to your current diet. Green smoothies, salads with meals, etc. Hi, I love reading your blog..you are very inspirational. When you cut up the bananas to freeze, do they turn brown in the freezer? What is an environmentally friendly container to use? I have been having a green smoothie everyday, toasting you for starting this green heaven for me. Thanks. I peel the bananas first and then slice…then freeze. They don’t seem to turn brown, but I go through them so fast anyway. I am using up my stash of baggies and then switching to brown wax paper bags (available at health food stores/whole foods, etc). It certainly is a green “heaven”, isn’t it? I’m loving it. 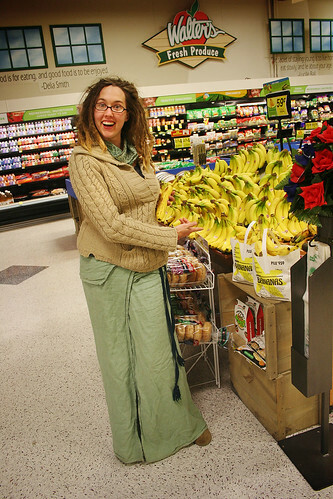 when you’re in columbia check out EARTHFARE on devine street, they sell awesome ‘ripe’ bananas all of the time at a steep steep discount…and if there aren’t any out just ask…often times they let me pick them out myself from the other organic bananas! This blog is great, thanks for the recipes and the philosophy. For a potential future blog post, I would like to hear (or read) your thoughts about local and seasonal eating. It is a dilemma for me. As a Minnesota native, bananas are not grown anywhere near here; mostly they get shipped here from South America. I love fruit, but we can grow few fruits here. How do you balance the choice between eating healthy, and making environmentally conscious food purchases? It is great in the summer/fall when these overlap, but bananas in the winter in Minnesota leaves you with a decision. Is it okay to eat the fruit we want year-round, or should we only be eating what our local foodshed can produce? Everyone has different convictions about food, and mine is that my family’s health comes first. We will focus much more on local eating when we head South, and also to the West where we can hit farmer’s markets everywhere. The majority of our food WILL be local at that point. Again, it’s all a balance. I am mindful of it, but I make the choice based on my own consciousness. cool – thanks for your input. There are so many things that factor in to the equation that simply deciding what to eat has become so challenging. Jake I totally agree with your comments and Sara thanks again for all the other areas in your life you try to live simply. I think another way people forget to make changes is in the way they vote. Even now there are candidates running that want to keep our food supply safe, keep our local farms running, crack down on conventional farms and the havoc they cause, and actually get back to a country that produces its own food! Don’t forget to make your voice heard in this way in the upcoming elections. I can’t believe I found someone else like me. I am a spotted-banana hunter that is coming out of the closet. I have been known to stop at up to 5 groceries looking for those little white bags sitting in the banana section. Sometimes I even drive up to the door and send in a teenager to scout for me. When I find those bags, I buy them all regardless of how many. Here in Dallas they are always $1 per bag or $.19 per pound. yeah! My freezer stays full of these little gems. Oh, and while I am confessing, I might as well add that I have been known to eat up to 4 or 5 bananas in a single day. I’m with Emma–a spotted banana with natural PB, well, I just can’t resist! Question, is there ever too many bananas? I can eat up to 4-5 a day. I’m not overdoing it am I? Hi, I found you through… ummm, not sure any more – mainly just in blogging around. I love the banana facts and idea..
I’m working on my dr of naturopathy, but having a real hard time applying the principles of all natural eating.